Once up I drive over to the Yulara resort and checked out the helicopter companies which have offices there. I manage to get a helicopter flight for 10:30 am. The cost is $120 instead of the normal $180. I quickly take Frank out to the Rock and then I go back to the airport. The flight is scheduled to be 36 minutes (very strange length of time, but I presume that when the start up and shut down time is included, the figure rounds out to 45 minutes). 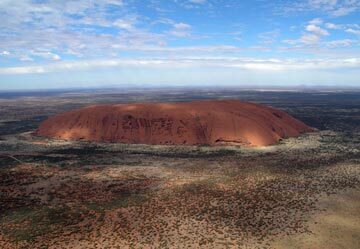 The plan is to go over Uluru and then the Olgas. What a flight! These rocks sure stand out from the air and are spectacular! It is a great experience and even though I am used to flying in helicopters for work, I have a great time. I would recommend it to anyone visiting. I was lucky to wrangle the front seat as since the other three people were together and paying full price (they did not know what I was paying), I thought that they might demand the best seat. However, when I discovered that their digital camera battery was dead, I offered them the loan of one of my batteries on the condition that I got the front seat. They happily agreed. After the flight I go back to the Rock. My plan is to climb it. The local Aboriginals have recently adopted the stance that they would prefer that you do not climb it but it is not banned, although (as I pointed out earlier), they seem to close it for "weather" related purposes for no real reason. My view is that since people can climb up and over things like St Peter's Basilica in Rome (which is my sacred site as a Catholic) and us Catholics have no objections, then they should also not stop us enjoying it. 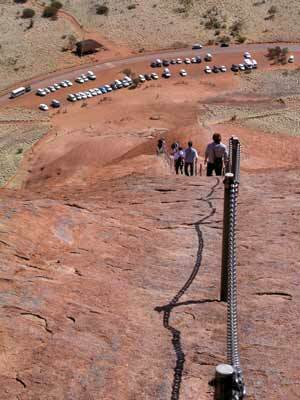 Well, this will be the one and only time I climb it, not because of this reason, but because it is very hard. It takes me just over an hour to get to the top. It is a very hard climb for the first one third, then a little easier and then easy. The chain on the first section is useless except when coming down. 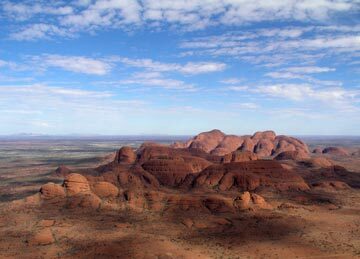 The views are spectacular and I take some photos of the surrounding countryside, especially of The Olgas. I also take a panoramic shot (12 photos) from the marker on the top. The return walk back down is also hard in spots. We head back to the resort to refuel and we get some more supplies and post some cards. 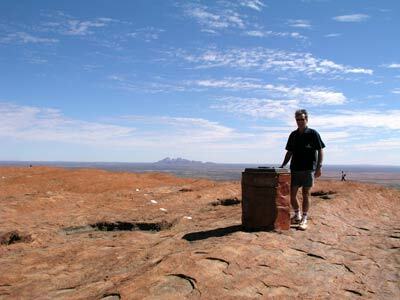 After this we meet up with the others as planned (they had gone to The Olgas) and we drive back to to Curtin Springs. Curtain Springs has a free camping area and there are a lot of people staying here rather than at Uluru. It works out cheaper for them to stay here and pay extra for the petrol to travel (at least when we went and if you have a car full of people - eg backpackers). The place has a bar where we have a few drinks. There are also cabins and some buses stay here. It is not as nice a camping area as at Yulara, but it has a more friendly feel. Frank and I go and cut some word up the road a bit. Every evening there are camel treks. One of them goes out across the highway towards Mt Connor and stops at a sand dune where there are good views of the sunset on Mt Connor. 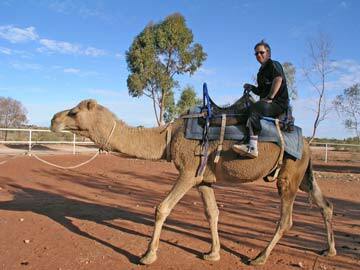 Before this, the camels are paraded around and I decide to go for a ride on one. 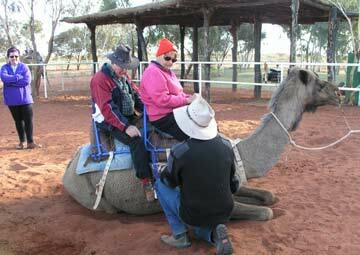 As I have already spent a lot of money today, I do not feel like doing the sunset ride (I cannot remember the price but it was a bit) but I want to at least say I have ridden a camel. It is a bit like when you are a kid and there are ponies at the local show and you have to have a go. I get on the camel and am led around the paddock like a little kid. It cost something like $5. Smelly beasts! Anyway, the ones who go on the sunset ride say that it was enjoyable. After they return, Frank and I start the barbecue and we cook a dinner of sausages, bacon and vegies. After dinner we go to the huge common campfire. Here we talk to lots of people and meet some very interesting ones. There are some families on year long trips with their kids, home schooling them as they go and another single mother with a daughter who has been on the road for a couple of years. I cook an apple crumble dessert in the camp oven and all our group share it (with many envious people looking on). We leave Curtin Springs at 8:30 am and travel along very good tar roads via the small ltown of Mt Ebenezer to the Stuart Highway. It is about 160 kilometres and it only takes us about 100 minutes. We hit the highway at Erldunda. We continue south on the highway and stop 20 kilometres south for morning tea at a truck stop. We then travel on to Kulgera (about 55 kilometres) where we stop for a snack (an ice cream for me and pies and hot dogs for others). After this we drive to Marla in South Australia. 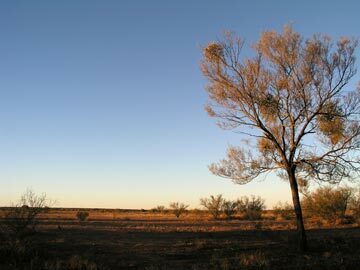 It is 21 kilometres to the Northern Territory - South Australia border and another 160 kilometres to Marla. The road is excellent and we sit on about 100 kmh. At Marla we have lunch and get some supplies. I also refuel. Frank and I decide to have pies. We had originally planned to stay the night in Marla but as we have got here at 2 pm, we decide that it is a bit early to stop. We have a beer in the pub before deciding to move on towards Oodnadatta. We take the Oodnadatta Track which heads east just south of Marla. It is in very good condition and we average 70 to 80 kmh. At 4:25 pm we stop at Coongra Creek. 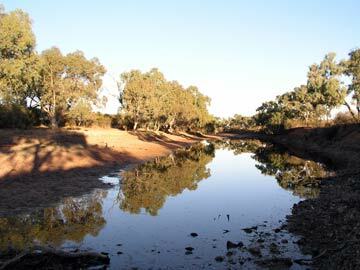 This is a dry creek located at GPS S27º 10' 37.7" E134º 19' 15.2". There is a semi-perminent waterhole here, adjacent to a nice camping spot on the right side of the road just over the creek. We decide that this is a good spot to spend the night. It is about 81 kilometres from Marla. Dinner was steak (from Sydney) and vegies.